For Campese, speaking in music has been a long, fruitful conversation that’s taken him around the world and provided him with many opportunities. On Saturday, it’ll take him back to his hometown for a show at the Madison Theater. 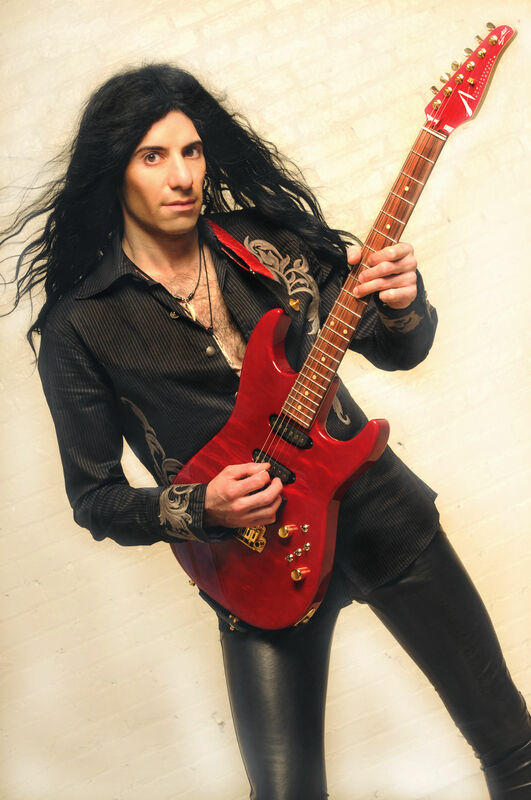 While Campese has a distinguished recording career as a solo artist, his work with the Trans-Siberian Orchestra and session gigs, the live setting is where he flourishes. “The best thing is live,” he said. “In the studio, you can overanalyze it. Live, you go for it! “Everything comes together, you have the energy of the crowd, it’s the end result of what you put into your music,” he enthused. 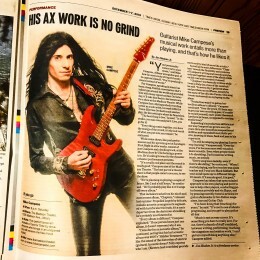 While some shows, like past performances and his upcoming set at Saratoga’s First Night in a few weeks, consist of just Campese and a backing track, at the Madison show he’ll be helming a power trio. He’s looking forward to the dynamic a theater performance presents. “It’s a really cool place and the sound is really good,” Campese says of the Madison Theater. “The best part of a theater show is that people come to see you, to see the show. That includes tracks from his ninth and most recent album, “Chapters,” released last summer. Propelled largely by delicate, melodic acoustic arrangements augmented with tasteful electric leads, it’s a sonic departure from the dexterous shredding he’s probably most known for. “Every album is different,” Campese explained. “If one person hears just one album, it doesn’t represent who I am. As well as its sonic differences, “Chapters” reveals the flexibility and evolution of Campese’s writing and recording styles, as he put together most of the album while on the road and recorded it himself. Note: This performance will include a Toys for Tots toy drive. Anyone who brings in an unopened toy will receive one free movie ticket. “‘Chapters’ was basically written while I was in Italy (on a tour of the country),” he said. “In every city, I gathered ideas and put them on my iPhone, usually by the name of the city, like Parma. One song I wrote exclusively on my laptop on the plane. Expanding his production skills is just one way Campese has grown over the years. He’s also honed his compositional abilities and expanded his stylistic palette, drawing in blues, funk and jazz to his repertoire. “I’m still developing my playing; I never stop learning,” Campese said. “Over the years, I’ve become more well-rounded, more versatile. Even when people think I do shredding, I’m focused on writing music, on melody. 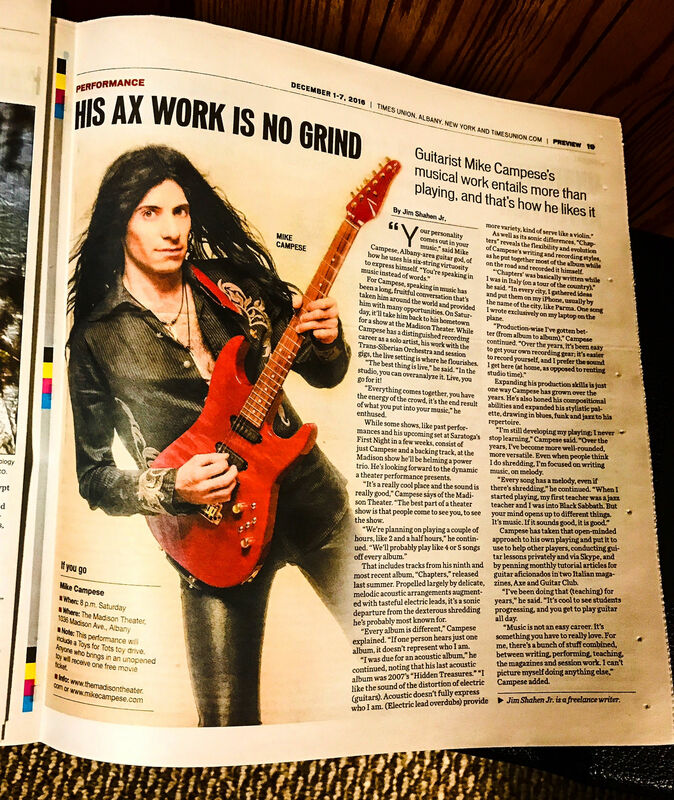 Campese has taken that open-minded approach to his own playing and put it to use to help other players, conducting guitar lessons privately and via Skype, and by penning monthly tutorial articles for guitar aficionados in two Italian magazines, Axe and Guitar Club. “I’ve been doing that (teaching) for years,” he said. “It’s cool to see students progressing, and you get to play guitar all day. “Music is not an easy career. It’s something you have to really love. For me, there’s a bunch of stuff combined, between writing, performing, teaching, the magazines and session work. I can’t picture myself doing anything else,” Campese added.